Now, normally the only time Justin Timberlake would be in the same room as members of Cirque du Soleil is if A) Jessica Biel really had her heart set on seeing Zumanity for her birthday or B) A freak snowstorm resulted in Timberlake uncomfortably curled up in a plastic chair next to some mimes dressed like fish or whatever at the Las Vegas airport. 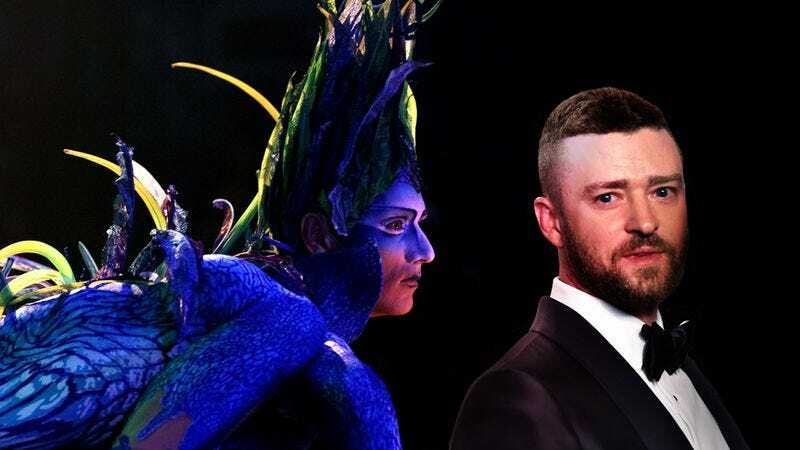 But now the former child actor turned nine-time Grammy winner and the former French acrobatic troupe turned international money-printing enterprise are due to meet in court, as Cirque du Soleil is suing Timberlake for allegedly sampling their music without permission. TMZ has the details on the lawsuit, which alleges that Timberlake and his producer Timbaland (bet that resulted in some hilarious misunderstandings in the studio) lifted a sample from “Steel Dream,” which appeared on the soundtrack album for Cirque du Soleil’s 1997 stage show Quidam, without permission. The alleged ripoff appears at the four-minute mark of the epic seven-minute “Don’t Hold The Wall,” from Timberlake‘s 2013 album The 20/20 Experience. An eerie little melody with a single female voice and music box, the intro to “Steel Dream” does sound kind of like the sample on “Don’t Hold The Wall,” although you’d have to isolate the track from Timberlake’s multi-layered song to be sure. It also sounds kind of like the theme for a horror movie about killer dolls, but the last thing we need is getting them involved in this mess. You can judge the similarities (or lack thereof) for yourself below.